Stanford University full-time MBA classes are typically scheduled during the day. Stanford offers one student intake per year, with classes beginning in the fall semester. At the completion of the core curriculum, before beginning electives and areas of concentration, students participate in a global management immersion experience between their first and second year of the MBA program. It is usually done after a full-time, 8-10 week summer internship. In the first year, Stanford University full-time MBA students dive into complex managerial issues with the General Management Perspective series of courses. Toward the end of the first quarter, students develop a personalized plan for General Management Foundations courses, which will provide the base for the general management education. These courses offer a menu of choices in each required discipline, calibrated to each student’s skills, experience and future goals. The Global Management Immersion Experience (GMIX) encourages MBA students to gain hands-on knowledge of international management by working in a corporate, government or nonprofit setting for a minimum of four weeks in a region new to them outside the United States. Students can also participate in Global Study Trips as yet another option for fulfilling the Global Experience Requirement. These trips are intense personal experiences that foster long-lasting bonds with peers and people across cultures. During the second year, students can take up to 18 electives to broaden their experience and perspective, or broaden their knowledge in a specific area. Possible elective courses include: Accounting, Entrepreneurship, Finance, General Management, Managerial Economics, Marketing, Operations and Information Technology, Organizational Behavior, Political Economics, and Strategic Management. Students can take courses outside Stanford Graduate School of Business and apply approximately 15 class units toward the MBA degree. The entering Stanford University full-time MBA Class of 2020 is comprised of 419 total students out of 7,797 applicants. Roughly 41 percent of those students are female and 42 percent are of international origin. Students enter the program with an average of four years professional work experience. The average GMAT score for students in the entering Class of 2020 was 732. International students who took the TOEFL scored an average of 113. In the Class of 2018, 95 percent of graduates received job offers by three months after graduation, and 81 percent of students had accepted a job offer. The average base salary was $145,559, with an average signing bonus of $31,146. Students flocked in large numbers to the technology industry, with over 33 percent of graduates accepting job in the tech field, likely in large part due to the school’s proximity to Silicon Valley. The next most popular industry was finance at 31 percent, followed by consulting at 18 percent. The Stanford University full-time MBA degree tuition for the nine-month academic year is $70,590. Additional expenses may include living allowance, books and supplies, instructional materials, transportation, medical insurance and orientation costs. The estimated total cost for the nine-month academic year for on-campus students is $115,797, and for off campus students, the estimated cost is $118,146. Fellowships are available to all U.S. and international MBA financial aid applicants who can demonstrate financial need. The Charles P. Bonini Partnership for Diversity Fellowship Program offers a unique educational and work opportunity focused on supporting diversity. Recipients complete a 9-to-12-month internship with a corporate partner prior to enrolling at Stanford. During the internship, students receive a competitive pre-MBA salary and benefits. They also will receive a full-tuition grant for two years at Stanford GSB. 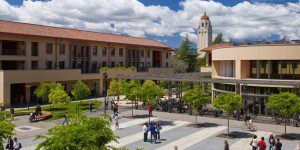 The Stanford Africa MBA Fellowship Program pays for tuition and associated fees (approximately $170,000 USD) for citizens of African countries with financial need who wish to obtain an MBA at Stanford GSB. The fellowship was created to reduce the financial barrier for African citizens wishing to pursue an MBA at Stanford GSB. Up to six fellowships will be awarded annually. The Reliance Dhirubhai Fellowship Program provides future Indian leaders with the educational foundation to effect positive change in India. Stanford Reliance Dhirubhai Fellows will receive financial support for the cost of tuition and associated fees for each year of the two-year Stanford MBA Program (approximately 80 percent of costs total). Within two years of completing their Stanford MBA studies, Reliance Dhirubhai Fellows are required to return to India for a period of at least two years to work for an Indian organization. The Orbis Investment Management Fellowship is a $15,000 cash award to be applied toward tuition or course-related expenses for an exceptional, soon-to-be first-year MBA student, from any background, with any experience, who can demonstrate his or her talent and passion for investing. McKinsey & Company sponsors a scholarship opportunity for pre-MBA students who enjoy challenges and thrive in a collaborative work environment. McKinsey selects and celebrates a group of finalists with cash rewards (up to $10,000 per award), and other benefits including: ongoing mentorship from current consultants, networking opportunities with fellow peers across top MBA campuses, an invitation to a distinctive summer celebratory weekend event in Chicago. U.S. citizens and permanent residents applying to Stanford’s full-time MBA program are eligible for federal Stafford and Graduate PLUS loans, as well as private loans. Applicants to the Stanford University full-time MBA must have completed a Baccalaureate degree or recognized qualifications equivalent to a degree. To apply to Stanford University’s full-time MBA program, applicants must submit a completed application form, official copies of transcripts from each institution attended, current résumé, and two letters of recommendation, including one professional/workplaces references and one personal. The school also requires applicants to submit two essays. Official GMAT score or GRE scores must also be sent in by applicants, along with a $275 application fee. International applicants must prove proficiency in English. This can be done with eligible TOEFL, IELTS, or PTE scores. Stanford requires students submitting scores for these tests to earn at least 100 on the internet-based TOEFL, 600 on the paper-based TOEFL, 7.0 on the IELTS or a 68 overall on the PTE. All interviews are by invitation only. Candidates invited to interview are considered competitive for admission.